Air New Zealand has released another epic safety video in the lead-up to the release of the final film in The Hobbit Trilogy in December. 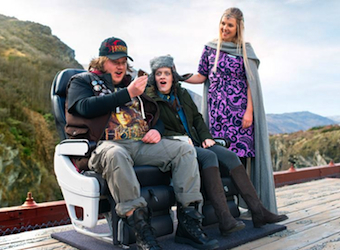 Cast-members from all three of The Hobbit films make appearances in ‘The Most Epic Safety Video Ever Made’, including Elijah Wood (Frodo Baggins), Dean O’Gorman (Fili the Dwarf) and Sylvester McCoy (Radagast), as well as director Sir Peter Jackson. Centreing itself around the air journey of two mega fans, Middle Earth characters relay all of the important safety messages – from fastening seatbelts on the back of a horse to inflating life jackets before bungee jumping. Air New Zealand shot the film over six days in New Zealand, including at Hobbiton and Central Otago, which feature in the films. The company has become well-known for its creative safety videos, having clocked up more than 30 million hits online in total. This latest video has already received more than 10,000 views in its first day online. Some of its others include ‘An Unexpected Briefing’, which kicked off The Hobbit videos in 2012, ‘Bear Essentials of Safety’ featuring adventurer Bear Grylls, ‘Safety Old School Style’ with Betty White and ‘Fit to Fly’ starring fitness legend Richard Simmons. The Hobbit: The Battle of the Five Armies will be released in December.